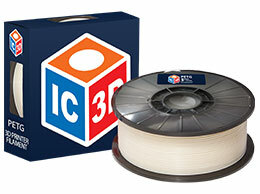 If you are looking for a great, and I mean GREAT, PETG then look no further than IC3D! This is the strongest PETG I have found. It prints fantastically (at 260° for me.) I have used quite a few rolls of this and will continue to do so. Give this stuff a try, you will not be disappointed! Just started using PETG as I couldn’t get the temps before with my lined hotend. Got this and another brand of PETG and got to say, this stuff is great. prints smooth and layer adhesion is awesome even printing as low as 240º. Printing Quadcopter parts and having no regrets or worries about the strength or holding power with this filament. that and the Bright green is, well,.. BRIGHT!! almost yellow in color (Lulzbot green?) Love supporting the little guys also! great communication and awesome people! Highly recommend not just the filament but the company it’s self! Errr maybe giving IC3D’s PETG another five star review could make these reviews a bit suspicious, but I really can’t find a single flaw with it. It just lays so smoothly. I’ve tried many co-polys, and in my opinion, IC3D’s PETG is equivalent in quality to its competition- namely, Colorfabb’s nGen. In fact, after getting used to IC3D’s PETG for a while, I found myself paying less attention to my prints and worrying less about all the issues that can happen near the beginning stages of a print (looking at you, Chroma Strand). For prints at mid-stage, I found myself worrying quite a bit less than I worry when using other CPs such as the one’s mentioned above and including AmazonBasics PETG; I have not had an instance yet where layers were delaminating- reliable adhesion. I found that IC3D’s PETG is a bit glossier at finish than nGen is. In short, IC3D’s PETG has a lot of the great qualities that you’ll find in other and different CPs. The difference here is that IC3D’s stuff produces reliably repeatable results. In my opinion, this is the highlighting quality of IC3D’s PETG. Just do a tightly controlled quality check and calibration in the beginning, and provided you keep using those settings for the most part, you will churn out quality prints. Keep in mind also that IC3D’s PETG is also much more affordable compared to nGen and INOVA1800, which are, respectively, $40/750g and $55/kg. IC3D’s price at $33/kg is a good deal, and their price at $56/2.3kg, which comes out to $24.35/kg is a godsend. Not only is the quality better, more reliable, and more affordable, IC3D is also (I think) the only organization to fully disclose how their filaments are made. Good on them for contributing to open sourced knowledge base. All this combined, after I finish up using my various filaments from other producers, I will only be using IC3D filaments. Good job, guys. One thing to note: If you are using Cura Lulzbot Edition, do not use the preloaded temperature settings; Printing at 230C will not be a good experience. Use the temperatures suggested on this page. 1) Please, please start some sort of customer rewards system. I am not someone who prints enough to need a custom quoted order, but at the same time, neither am I someone who can have enough filament if I were to order just 2kg/week- especially if I want to used several of the different colors you offer. I imagine there are many folks like me, and if such a program were to exist, IC3D could have a very loyal fanbase. It can be credits to use towards purchases, albeit an already discounted price compared to other producers. It can also be other things such as early access to new/experimental filaments you guys are coming up with. 2) Do you guys plan to offer other colors/textures for PETG in the future? Transparent versions of the existing colors or special textures such as Prusament’s Galaxy Black PLA would be amazing.